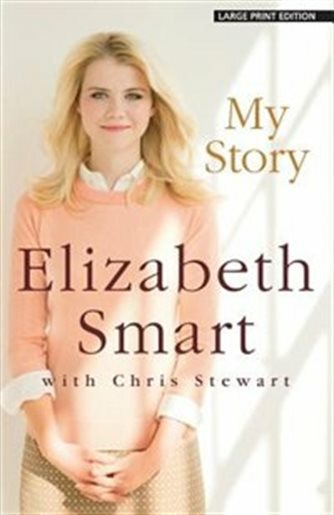 Last weekend I finished the next selection on my 2019 Reading List - My Story by Elizabeth Smart (with Chris Stewart). I had just finished Educated so I didn't want to immediately dive into another book about a Mormon woman who has suffered hard times, but this was a library hold that came in next. However these books are completely different, of course. I remember hearing about Elizabeth Smart on the news when she was first abducted and I'm pretty sure I remember where I was when I heard she had been found. I remember being so amazed that she was found alive and virtually unharmed. I didn't really think to read her book until it appeared on some bloggers' reading lists, particularly as a strong woman book. I am happy I picked it up. As many of you already know the story, there are no real spoilers here. Elizabeth was taken in the middle of the night from her home and held by a man and woman for about nine months. First they stayed in the mountains above her home in Salt Lake City and then the went to California, and then back to Utah. The man wanted her to be his wife, one of several young girls he planned to kidnap, and he believed he was a prophet of the Lord. The woman, also his wife, also believed she was a special messenger from God. To be clear though, they both knew exactly what they were doing and you could not say they were not criminally responsible because of a mental disorder. The book is written quite simply, which sort of makes sense since Elizabeth was 14 when she was abducted and wrote the book about 10 years after that. Her memories are those of a child and she doesn't get into explicit details of the sexual abuse she suffered. She does do a good job of explaining how she felt, what got her through, and why she didn't try to escape. We all think we would act differently but it's hard to say how we would actually react. She was so afraid that she would be killed or that he would track down her family and kill them. He groomed her into that fear and since she was only a child, it was easy to do that. One of the parts I loved so much was how she had messages from God that sustained her during her time of captivity. And how she felt that her recently deceased grandfather was walking along beside her as her guardian angel. Without those feelings, she is not sure she could have survived and endured. What a gift her faith was for her!! Another remarkable thing is how she survived after coming home, her mother told her not to let the experience bring her down; she could choose to move on and not look back and dwell on the pain. It was all very inspired and makes you really appreciate your blessings. This is a quick read so it is worth picking up, particularly if you remember the news about her.